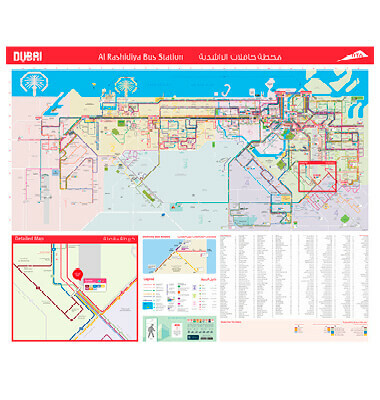 Explorer produced an integrated transport network map demonstrating the connections between Dubai’s road, rail, water and air public transport provisions on behalf of the Roads & Transport Authority. Using modern schematic style, in which the lines bend at only 30, 60 and 90 degrees, it demonstrates the available transport options in a simplified way, using bold colourful lines. The map features key landmarks illustrated in 3D, stations, stops and routes, integrating more than 120 modes of transport such as Dubai Metro, Dubai Tram, Palm Monorail, local bus routes, Central Business District bus routes, feeder bus routes, express bus routes, intercity bus routes, ferries, water taxis, water buses and abras. It was printed as a dual-language Arabic and English wall map for display in transport hubs.